Dame Kiri Te Kanawa is one of the most beautiful soprano voices on the world music scene. Besides conquering opera houses and concert halls on every continent, her prodigious recording output includes Christmas music, classic and folk songs, oratorio, concerts with the world�s principal orchestras, seventeen major operas, musical theatre and offerings from composers including George Gershwin, Cole Porter and Paul McCartney. Kiri was created a Dame in 1982, and has been awarded both the Order of Australia and the Order of New Zealand. She is an Honorary Member of the Royal Academy of Music, was presented with the International Achievement Summit award by Dame Julie Andrews, and has been inducted into the Hollywood Bowl Hall of Fame. Four decades and forty recordings later, she received the British Classical Recording industry�s Lifetime Achievement Award. 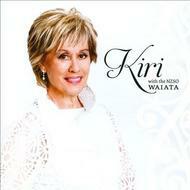 With 'Waiata', Dame Kiri marks the fiftieth year of her recording career and her third all-Maori offering. Following on the world-wide success of her earlier CD of all-Maori songs (1999), Dame Kiri was inspired to study more about the Maori song repertoire. She enlisted the help of music supremo Carl Doy, and together they surveyed and considered material from the large resources of existing Maori music. The pair diligently examined old Maori prayers, researched the favourites of much-loved 1940s soprano, the late Ana Hato, and Maori adaptations of international hymns and later compositions. They chose songs offering a popular chant to aid fisherman, praise for soldiers in battle, the playful sporting of a water god, the love-legend of Hinemoa, and sorrow for those lost in wars. Offerings include the beautiful traditional Maori interpretation of �Ave Maria�, the stirring Maori version of �How Great Thou Art� and international favourite �Blue Smoke� sung as composed, in its original language.